Deb's Cup of Tea: Snow-what? 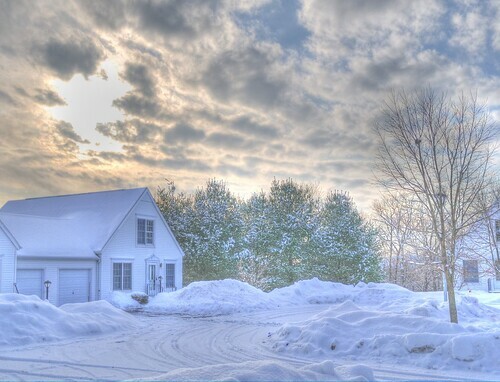 Carole mentioned in an email to me that the section of Connecticut where she lives has had, so far this winter, nearly 50 inches of snow. They awoke to another 16-18 inches this morning which may mean they are approaching the 5 feet of snow mark. And to think it sort of "started" on Monday, November 8th when I was leaving to head back to Illinois after my visit. This was wet stuff, almost half water. 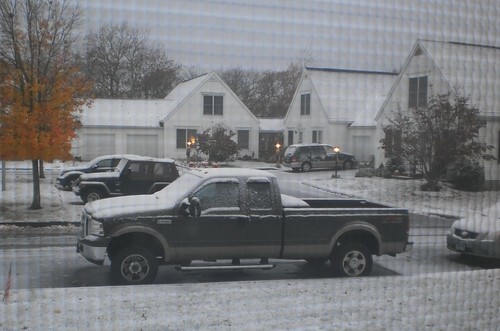 Carole took this photo of their snow. This is to the left of my photo above. It was taken over the weekend, and doesn't reflect the latest dumping. She uses some photo technique so this does look like a watercolor. The tree to the left in my photo is the tree to the right in hers. It's snowing right now as I type this. We aren't to get dumped on as the NE US did, but it is a snowy January, snowier than most in recent years. As I was searching for photos of my sister, I came upon photos of another January 30 years ago. 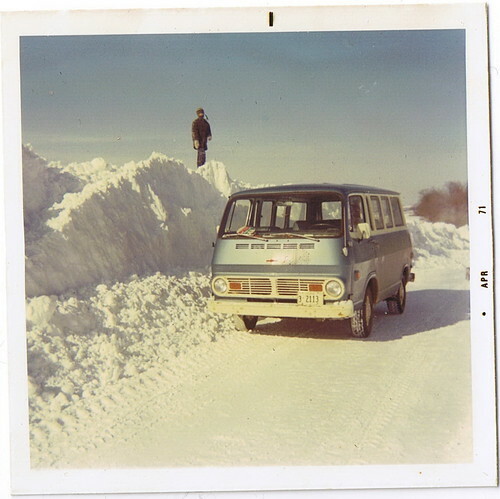 It was January, 1971, and this was the day after a blizzard. This is the road that runs North South in front of the farm, which is off camera to the right. To the left is a gently rolling hill with nothing to stop a snowstorm coming out of the west northwest. The neighbor to the south of us had a front end loader on his tractor so he plowed his drive and then a single track down to us and plowed our drive. I believe this is the storm that caused my mother to call one of the county commissioners and chew him out for not even attempting to plow our road up to us. We heard, from people to the north, that the plow made it to the farm on the other side of the visible woods, got into those woods and turned around because of deep snow. We were without power for three days, but we had ample supplies of wood for the furnace, and gas for the gas stove. Dad was working in Waukon at the time. He attempted to get home but turned back because the roads were impassible. The plow had opened the road within 24 hours of the snow ending but hadn't come back to finish the job to us and our neighbor. Within 12 hours of her angry phone call, we heard the plow. It wasn't an easy job, to be sure. He had to dig the road open; he couldn't shove the snow to the side because there was no place for it. He was followed by a dump trunk that hauled the snow away. When they got to our neighbors, they carved a place to turn around and then worked at widening the road instead of pushing it all the way south to the main highway. They knew what they were up against. It would be 3 more days before the road was successfully opened to the highway, a 2 mile length from our house. 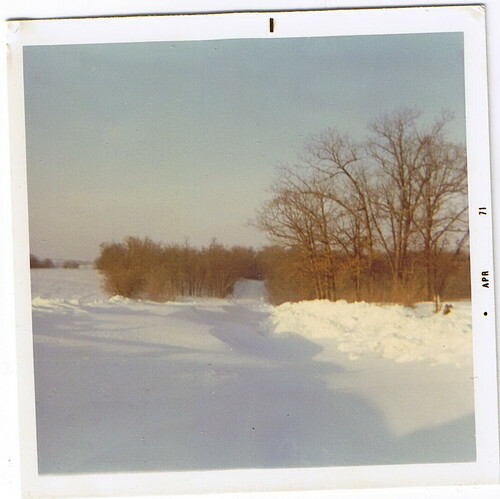 This is what the snow hill looked like across from the entry to our farm. They had not shoved that bank up that high. This was the height of the drift coming off the hill. That's a 1968 Chevy van, the first year Chevy made passenger vans. That's my brother, Steve, standing on the top of the drift. This wasn't the worst January snow that I remember. In 1968, out of the available 20 days for school, we had 7 and not all together. I can't find pictures of that snow. I didn't get my own camera until later so I don't know if we used mom's Brownie to take photos. I'll have to look at the photo dates to see if it was Christmas 1969 or 1970 when I took over family photographer. So, as we battle feet of snow, I am reminded of the storm of 30 years ago. I think we missed only a week of school from this one. It's supposed to be in the 30's tomorrow. I haven't shoveled the snow from the last storm. I have to shovel both of them now. I printed the lyrics to my favorite snow song last year. It's playing in my head right now. I have a craving for pizza and a malted for supper tonight, and a good book and a couple of purring cats.